Arianespace - Created as the first commercial space transportation company in 1980, Arianespace has signed contracts for more than 292 satellite payloads. Arianespace is responsible for the production, operation and marketing of the Ariane 4 and 5 launchers, and is a partner in the commercial operations of Starsem's Soyuz launch vehicle. AssureSat - Provides satellite service restoration to operators in the event of catastrophic failure. In the event of failures, subscribers will have rapid access to temporary satellite replacement services. Astrium - Earth observation imagery and geo-information products and services. Operator of the SPOT satellite family and the future Pleiades and SPOT 6/7 constellations. Exclusive owner of the commercial exploitation rights for TerraSAR-Xand TanDEM-X. Five additional satellites (Pleiades-1 and -2, SPOT-6 and -7 and TerraSAR-X-2) planned within the next three years. Astrovision - Entertainment and Internet content company that employs satellites to provide a live, continuous, true color, super high-definition video stream of the earth from space. Boeing Satellites and Space - Development and production of state-of-the-art space and communications systems for military, commercial and scientific uses. Canada Centre for Remote Sensing (CCRS) - Natural Resources Canada - Satellite imagery, remote-sensing images. Cidera - Through its satellite-based distribution network for the Internet, Cidera offers a complementary means of transporting broadband content for content providers, aggregators, and distributors. Commercial Remote Sensing Regulatory Affairs - Provides U.S. laws, regulations, policies, and related information pertaining to the operation of commercial remote sensing satellite systems. EarthSat - A world leader in the utilization of remote sensing data from aircraft and satellites and is the largest commercial provider of enhanced satellite imagery. EarthWatch Incorporated - Satellite imagery. EchoStar Satellite Services - EchoStar represents a significant source of Ku-band and Ka-band satellite capacity and spacecraft operation services with 10 satellites, ground-based teleport facilities, and an expansive terrestrial U.S. backhaul network along with 24-hour satellite access centers. Provides a network available for backhaul, aggregation and distribution of video, audio and data domestically and internationally. Eutelsat - Satellite communications solutions and expertise. Future Imagery Architecture (FIA) - FIA is the NRO's initiative to define, acquire and operate the next generation imagery satellite architecture. Working with NRO's mission partner NGA and consumers of intelligence imagery products to implement user requirements, it will integrate into the US Imagery and Geospatial Information System (USIGS). FIA is intended to provide a cost-effective, best value imagery architecture comprised of more capable imagery satellites. Gaia - A space observatory of the European Space Agency (ESA) designed for astrometry. The mission aims to construct the largest and most precise 3D space catalog ever made and totalling approximately 1 billion astronomical objects, mainly stars but also planets, comets, asteroids and quasars among others. See Gaia Archive and Wikipedia. Gilat Satellite Networks - A leading provider of telecommunications solutions based on Very Small Aperture Terminal (VSAT) satellite network technology. Globalstar - A consortium of leading international telecommunications companies established to deliver satellite telephony services through a network of exclusive service providers. Heaven's Above - Provides you with all the information you need to observe: satellites, Mir and the International Space Station, the Space Shuttle, the bright flares from Iridium satellites, and a wealth of other spaceflight and astronomical information. Hughes - Offer companies high-speed, broadband networks and satellite broadcast services. HyNet (Maryland Hybrid Networks Center) One of 17 Commercial Space Centers sponsored by the National Aeronautics and Space Administration (NASA). Primary focus is to develop hybrid networks that link satellite and wireless systems with cellular, cable, Internet, and telephone networks. Immarsat - Operates a global satellite system which is used by independent service providers to offer a range of voice and multimedia communications for customers on the move or in remote locations. Intelsat - Owns and operates a global communications satellite system providing capacity for voice, video, corporate/private networks and Internet in more than 200 countries and territories. LARES (LAser Relativity Satellite) - A low-cost all-Italian mission with a short development time that will enable achieving important scientific goals in gravitational physics, fundamental physics and Earth sciences fields. Launchspace - Source for breaking news on global commercial communications satellite issues, launches, regional business opportunities, contracts, financial analysis and more. Loral Space and Communications - A leader in satellite communications, Loral has substantial activities in both the manufacture and operation of geosynchronous and low-earth-orbit satellite systems, as well as in the development of satellite-based networks for the provision of an array of communications and information services. MDA - MDA is the world leader in space robotics and a leading supplier of satellite information missions and a world-renowned supplier of satellite payload systems and sub-systems. MDA Geospatial Services - A leading provider of advanced geospatial information products derived from the high-resolution RADARSAT satellites, commercial optical satellites, and aerial systems. Microspace Communications Corporation - The world's largest provider of broadcast video, data and audio satellite services for business applications. MirCorp - An international firm established by the Gold & Appel Transfer S.A. holding company and RSC Energia - Russia's oldest space company. In the past 50 years, the company pioneered Russian space technology, including all Russian manned space stations, launch vehicles, and satellite technology. NASA Landsat - Satellite data. 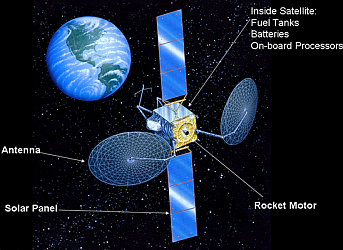 NASA: Remote Sensing - Satellite remote sensing introduction and history. ND SatCom - More than 30 years of experience in the field of satellite communication. One of the world's leading manufacturers and suppliers of equipment, fixed and mobile ground stations as well as satellite-based communication networks. NOAA National Environmental Satellite, Data, and Information Service - Latest research, launch information, imagery, and data related to GOES, POES, DMSP, and other satellites. NOAA Operational Significant Event Imagery - Produces high-resolution, detailed satellite imagery of significant environmental events which are visible in remotely-sensed data available at the NOAA Science Center in Suitland, Maryland. NOAA Satellites and Information - Provides access to global environmental data from satellites. OceanColor - Information and databases related to ocean color (meetings, reprocessings, spacecraft/sensor updates). OmniSTAR - A market leader in providing high accuracy positioning data via satellite channels and is at the forefront in the design and development of Differential GPS positioning technology. Phillips Satellite Today - Global provider of high-value strategic news, business intelligence and marketplace research to executives in the launch, commercial satellite and MSS industries. Radionavigation Laboratory - Located at University of Texas, Austin. Explores ways to exploit and protect radionavigation systems such as GPS. Develops technologies that advance software-defined GNSS receivers, enable opportunistic navigation, ensure navigation security and integrity, explain ionospheric phenomena, and provide high-fidelity radio-frequency datasets. SatTrackCam Leiden Station (B)log - SatTrackCam Leiden (Cospar 4353, formerly 4352) is an amateur satellite tracking camera located at Leiden, the Netherlands. It makes accurate positional measurements on satellites of interest, mostly classified satellites -i.e., spy satellites- in order to determine their orbits. Satellite Broadcasting and Communications Association of America (SBCA) - National trade organization representing all segments of the satellite industry. Satellite Communications - Compilation of resources from Business.com, including: Associations, Components & Systems, Consulting Services, Direct Broadcast (DBS), Earth Stations, Manufacturers, Satellite Phones, Software, and System Operators. Satellite Communications Systems, Inc. (SCSI) - SCSI provides telecommunications services by satellite between the U.S. and the Caribbean, Central and South America, Europe and Africa. Satellite Encyclopedia, The (TSE) - A hypertext document built around a dictionary of 2000 satellites. Each satellite fact sheet contains basic information, launch date, official identification, and extensive description of the payload. Satellite Manufacturers and Subcontractors - Directory of satellite manufacturers and subcontractors. SES - A world- leading satellite operator, providing reliable and secure satellite communications solutions to broadcast, telecom, corporate and government customers worldwide. Space Available - Extensive background information on how satellites work. Space Systems/Loral - Full-service producers of commercial communications and weather satellites. The company, a subsidiary of Loral Space and Communications, designs, builds, and tests satellites, subsystems, and payloads; provides orbital testing, procures insurance and launch services; and manages mission operations from the Mission Control Center in Palo Alto. SpaceCom Systems - Specializes in marketing point-to-multipoint C-band and Ku-band transmission services, and provides companies across the U.S. with advanced satellite technology for audio and data broadcast services. SSE Telecoms - A leading provider of digital satellite communications products for systems integrators, service providers and enterprises in more than 110 countries. StarBand Communications - Consumer two-way, always-on, high-speed satellite Internet service. The StarBandSM system consists of a 24x36-inch satellite dish mounted on or near your home. Two standard coaxial cables connect the satellite dish antenna to a PC or a StarBandsatellite modem." The antenna both sends requests to the Internet and receives Internet content via the satellite, which is in orbit approximately 22,300 miles above the equator. The satellite, in turn, communicates with StarBand's hub facility, which has a direct connection to the Internet. Station711 - Services mobile satellite communication networks worldwide for the maritime, land and aviation sectors. United Nations Operational Satellite Applications Programme (UNOSAT) - A technology-intensive programme delivering imagery analysis and satellite solutions to relief and development organisations within and outside the UN system to help make a difference in critical areas such as humanitarian relief, human security, strategic territorial and development planning. Vega - Vega is an ESA optional programme with the participation of seven Member States: Belgium, France, Italy, The Netherlands, Spain, Sweden and Switzerland. The programme's main objective is to provide Europe with a safe, reliable and competitive capacity to carry science and Earth observation satellites into orbit, while perfectly complementing the heavy Ariane 5 and medium Soyuz rockets already launched from Europe's spaceport in French Guiana. WorldSat International, Inc. - Consumer based products produced from satellite imagery. WWW Virtual Library: Remote Sensing - Remote sensing, remote sensing index, remote sensing list, remote sensing organizations, satellite data, remote sensing conferences, remote sensing societes, remote sensing journals, GIS. This webpage last updated on Monday, August 21, 2017 9:04 AM.